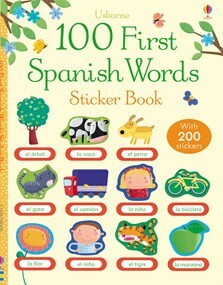 There are a hundred everyday Spanish words for English speakers to learn in this fun and interactive first word book. Little children can match over 200 stickers to the words and pictures on the pages as a fun way to build Spanish vocabulary. A brilliant aid for young children learning Spanish, and includes a pronunciation guide to hear all the words at the Usborne Quicklinks website.